Timothy Noah’s Great Divergence book: Can unions really recover? Either everyone has to be in a union, or nobody will be in a union. 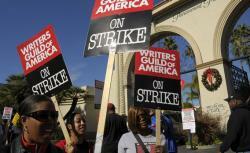 WGA members on strike in 2007 at Paramount Pictures studio. Very much agreed that we can (and should) care about both aspects of the Great Divergence. I’m less sure I agree about labor unions. In fact, I’m not sure I even agree on the meta-point that this is something liberals have given up talking about. Perhaps its just the circles I travel in, but I feel like for the past several years I’ve been inundated by exhortations from people on the left to care more about labor unions—and to write more about the central role reviving them must have in a progressive political agenda. And I’m convinced, to a point. The argument in your book that, as a historical matter, the decline of labor unions played a big role in spurring the divergence is certainly convincing. There are a range of other social ills I’m prepared to lay at the feet of labor’s declining clout in D.C. And my father’s a longtime member of the Writers Guild of America, which represents movie and TV writers, so I’ve never been under the impression that unions are per se antiquated or unsuited to the modern workplace. But all that said, I never read a realistic forward-looking plan for the revival of unions. Take the D.C. grocery market, where we shop sometimes at unionized sources (Safeway, Giant) and sometimes at nonunion ones (Whole Foods, farmers’ markets). If the UFCW succeeds in making unionized chains systematically less profitable than nonunionized ones, then that just guarantees that over time investment capital will flow into the nonunion ones and they’ll expand faster. America’s unionization rate has been in decline since the 1960s. Do you think there’s some plausible method by which this gets turned around? I’d be happy to see something like the late Employee Free Choice Act pass, but not only do the legislative prospects look extremely dim, I’m very skeptical this would really tackle the underlying drivers of de-unionization.